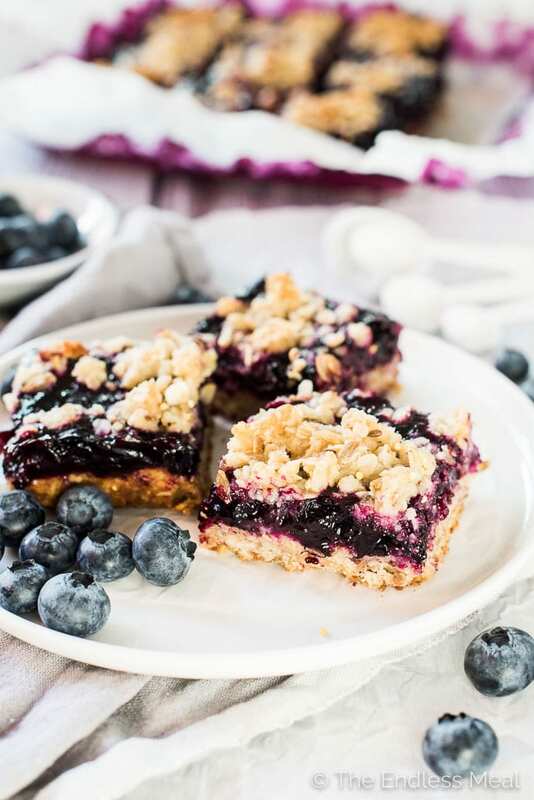 These delicious Blueberry Jam Bars are like a blueberry crumble or blueberry crisp formed into little bars. They are made with an oatmeal crust and loaded with fresh blueberries. It's a healthier dessert recipe that can easily be made vegan + gluten-free + refined grain free. You will LOVE it! Look at all those blueberries! Are you having a moment drooling over their pretty color, too? My life has been stained that beautiful purple blue all week, and I'm so not complaining. I bought 6lbs of big, plump BC blueberries before I set to work creating these Blueberry Jam Bars. I ended with TONS extra and (I'm not even joking) they disappeared in 2 days. I'm surprised little Ava and haven't turned blue ourselves. 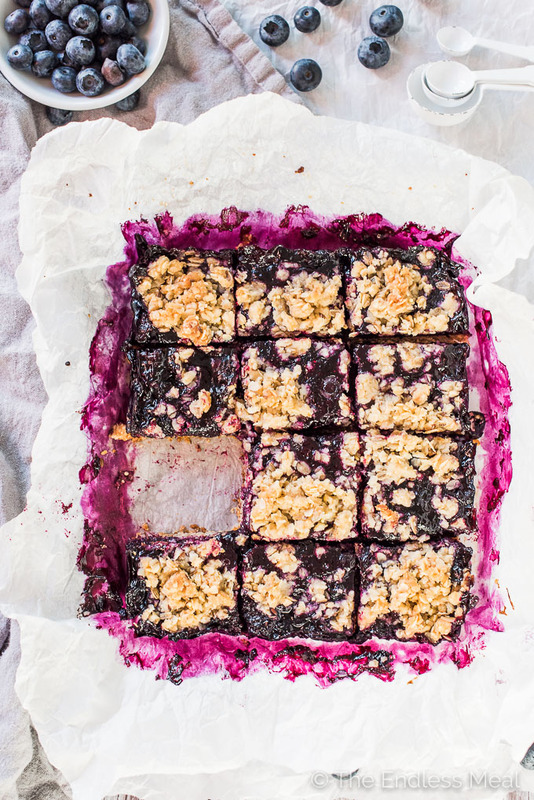 This recipe is similar to my go-to blueberry jam bar recipe. I've made a few tweaks to make things a little healthier and worked out some options for different diets. If you're like me and eat everything, congratulations, this recipe is for you! If you're vegan or avoiding refined grains, sugars, or gluten, I've got a few simple substitutes that keep this recipe as delicious as the original. 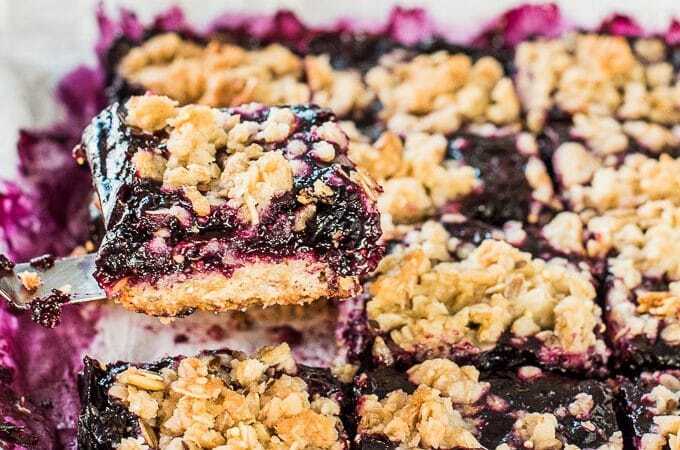 What makes these blueberry jam bars healthier? I'm not going to sit here and tell you that these blueberry jam bars of the be all and end all of health food. That might be pushing it. But they are healthier than their original version. 1. Tons of blueberries. I've doubled the number of blueberries I normally use. 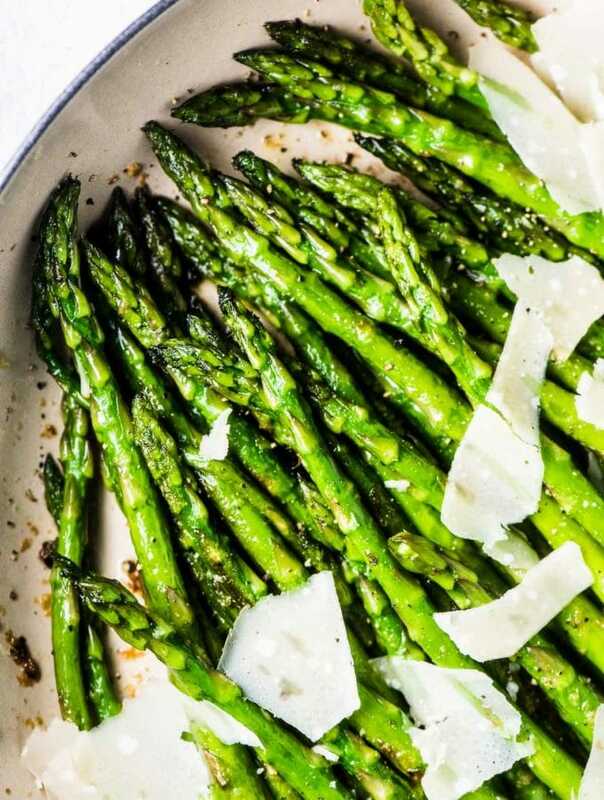 These babies are loaded with those big, plump superfoods. 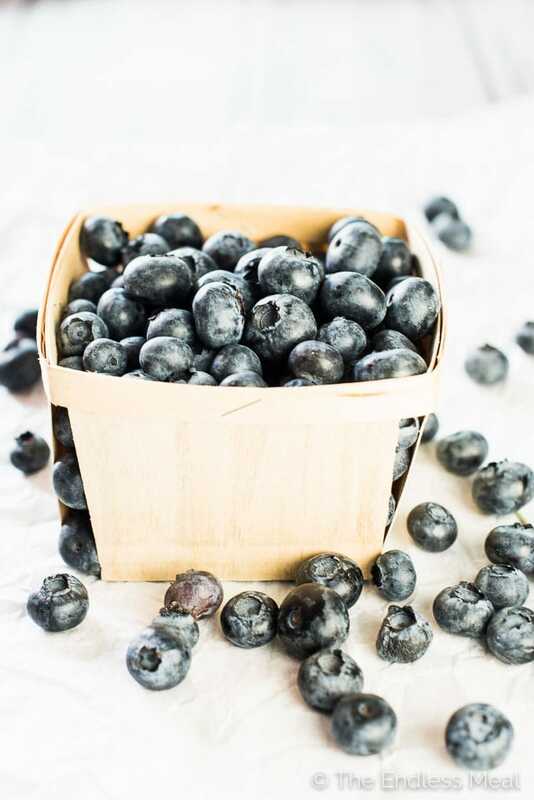 More blueberries = healthier bars. 2. More oats, less flour. Usually, jam bars have a 1:1 ratio of flour and oats. I thought I'd experiment to increase the oats and it totally works. I also tried a blend of ancient grains oatmeal to further up the health factor. More whole grains = healthier bars. 3. 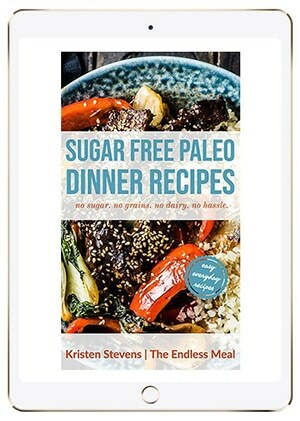 Less refined sugars. I experimented with different sugars and found that coconut sugar works as a substitute for regular sugar. Of course, you can always use white sugar if that's what you have on hand. I've also reduced the overall amount of sugar, both in the bars and in the jam. They're still sweet and dessert-like, so there's really no need for more sugar. Those blueberries! I'm having (another) moment. They're just so perfect. Here in BC, summertime is all about blueberries. They start their annual takeover in July and we pig out on them until September when we shed a tear and say goodbye for another year. Sure, there are frozen blueberries, but the fresh ones are the extra special treat. They're like eating candy, only 100 times better. They get added to my salads by the fistfuls, sprinkled heavily on yogurt, baked into desserts, made into marinades for chicken and salsas for fish. How do you get your blueberry fill? So what makes these blueberry jam bar so freaking awesome, you ask? THE CRUST: This is the kind of crust that isn't going to fall apart in your hands the moment you pick up the bar. It has a little bit of a crunch to it, but not too much. It's sweet and oaty and delicious enough to eat on its own. THE JAM: This layer is thick as there are few things more disappointing than a skimpy layer of blueberries. The jam is thickened both with the natural pectin that is in the blueberries and with a little corn starch. It creates a thick, jammy layer that is the star of the show. THE CRUMBLE: Any blueberry jar is only as good as the crumble on top. The crumble is the same as the bottom layer, but because it's not pressed firmly into the pan to create the base, it stays light and almost airy. As delicious as the crumble is, I like to go easy on it so that lots of the blueberry jam pops through. It's just too pretty to cover up! 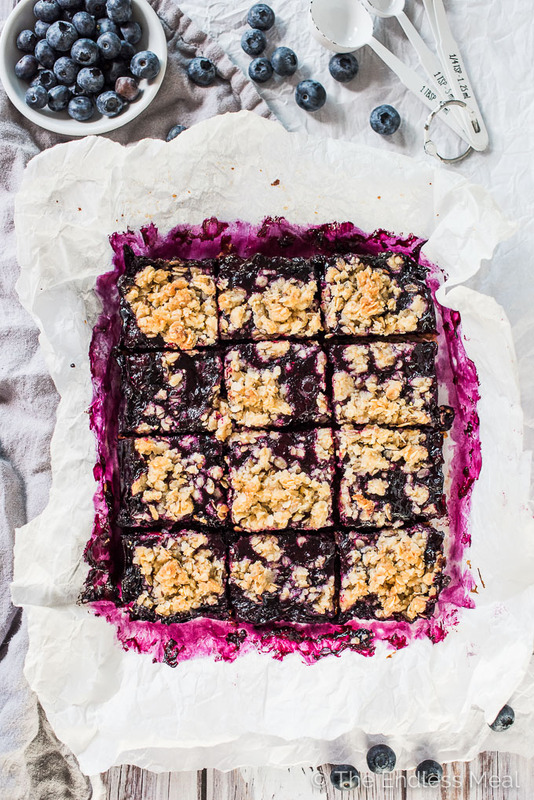 If you make these Blueberry Jam bars make sure you snap a pic and tag #theendlessmeal and#bcblueberries on Instagram so I can like and comment on your photos. I love seeing TEM recipes you create! Set your oven to 350 degrees. Line an 8X8 inch baking pan with parchment paper. In a small pot, melt the butter and coconut oil. Pour the honey into the pot. In a large mixing bowl, add the rolled oats, all purpose flour, sugar, and sea salt. Pour the melted butter into the bowl (keep the pot handy) and mix well. Set aside 1 cup of the mix and pour the rest into the prepared baking pan. Press down firmly to create the crust. In the same pot used for the butter, add all the blueberry jam ingredients. Bring to a boil over high heat, then reduce the heat to low. Simmer for 2 minutes, or until the jam thickens. It won't be as thick as jam from your fridge. Pour the jam over the crust and sprinkle the top with the remaining oats you set aside. 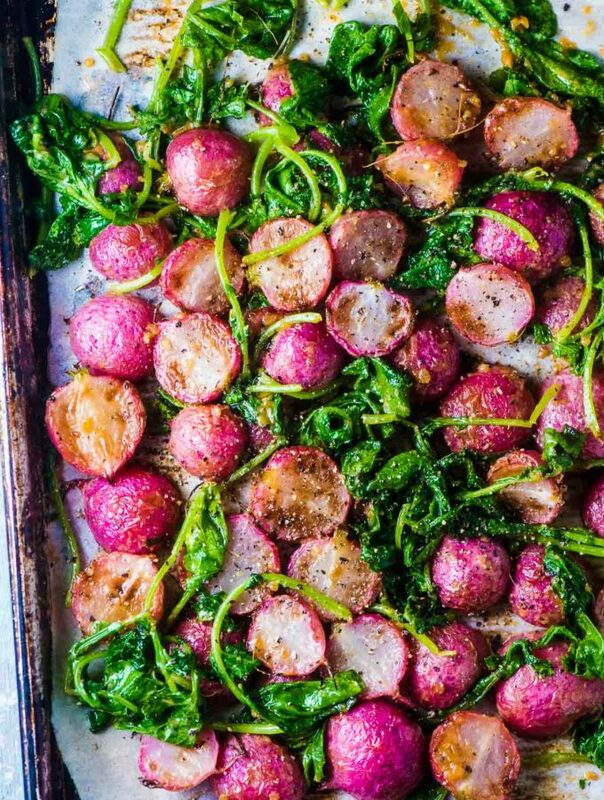 Bake in your oven for 40 minutes. Let the Blueberry Jam Bars cool in the pan then remove them with the parchment paper and cut into 12-16 bars. Love these bars! So nice to have a healthier way to make them. Will be making them again! I’m so happy you liked them!! Just made this and we loved it. I only put a bit of honey in the crust, skipped sugar as we dont like things too sweet. It was absolutely delicious, it is now in my favourites folder. Thank you!!! ? I’m so happy you liked the recipe! And so good to know it works well with less sugar! Oh man … that would be like cooking them on the counter top. Thanks for pointing that out! ? Hi. I cannot use oatmeal.. Have you ever tried this with quinoa flakes? I’ve honestly never cooked or baked with quinoa flakes so I’m not sure how they work. I would suggest referencing a recipe that uses them and them making the modifications with this recipe. This recipe is pretty flexible so you’ll be able to work with it pretty easily. I hope that helps! Absolutely love these bars Kristen! That’s one of the biggest things I miss about Van is the fresh blueberries and fruit. I’d give my right arm for a Kins!!!!! These bars are gorgeous and love that you’ve made them healthier! Aren’t BC blueberries the best? I wish I could send you some of these bars so you could get your fix!